Elaphe taeniurus is a species of long, slender, semi-arboreal snake. It is very colorful, is large and easy to keep and has normally a calm temperament. The most common subspecies kept in captivity are the E.t.taeniurus, E.t.friesei (pictured), E.t.callicyanous and E.t.ridleyi. 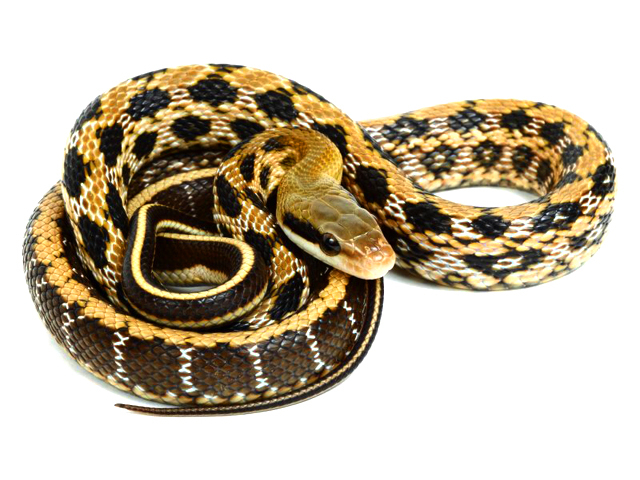 Elaphe taeniurus’ ground color is yellowish-brown to olive. The dorsal surface of the head and neck is unicolor. The markings on the back almost always consist of two pairs of black rounded spots, which join together. From each eye there is a dark stripe, which extends to the corners of the mouth. Babies and yearlings can be kept in racking systems. I prefer to allow my animals as much room as possible, so sub adults get 0.6 x 0.6 x 0.6 meters (2 x 2 x 2 feet) arboreal cubes, and adults get 1.2 x 0.6 x 0.6 meters (4 x 2 x 2 feet) enclosures. Ideally if you had the space, your adult beauty snake would happily use a 1.8-2.4 x 0.6 x 1.2 meters (6-8 x 2 x 4 feet) enclosure. They are very active so climbing space and interactive branches etc are a must. I usually rearrange the enclosures every so often to provide more stimulation. I prefer using PVC enclosures so the animals feel safer (having one side plexi and the others a solid colour). I offer a hide, and a lay box when gravid. I usually don’t add anything to them, unless they are babies and you can add a small amount of moss to raise the hide humidity. I have personally found good luck in keeping babies on paper towel. My adults get graduated to a coco-coir (Eco-Earth, Plantation Soil) once I feel the hazards of substrate ingestion have passed. I keep it slightly dry on the surface, then do a big mist and water dump once a week. I have standard bulbs on a 12hr on 12hr off cycle to provide “daytime”. My room is held between 22-26 ºC (70-80 ºF) standard. I find babies like it a tad warmer and my adults don’t seem to mind the “room temp” temperatures. These snakes often poop in their water. So changing frequently is a good idea. I just use standard tap water that is slightly cool to the touch. I offer a large cat litter pan as a water dish for my adults. This way they can easily soak their entire body. My animals are sitting around a 50% humidity range at most times. I live in a very dry climate so its hard to maintain static humidity. I counter that by adding a very large “soaker” dish to allow the animal to rehydrate and soak. I feed once every 5-14 days depending on animal size. I generally offer babies and yearlings more frequently then adults. Any breeding animals I feed weekly. I do travel to some expos through the year and “miss” feeding on a few weeks of the year and it doesn’t seem to upset the balance. They are eager feeders so frozen thawed rodents are preferred. I currently offer medium rats to my adults, and cycle in frozen day old chicks every now and then. Babies can be fed on mice or rats. Beauty snakes are amazing to work with, but they can be a little hard to read. They are very eager feeders and I find once you have them out they generally are ok to handle. As babies they “defensive” nip quite frequently. Spot clean as needed. I do a full enclosure sanitize when required (poop on the sides etc). Like all colubrids, the poop is stringy and messy. So a little extra work is required. I take the enclosure materials out and scrub them down if I see anything on them as well. I find these snakes to shed quite easily. Any stuck shed can be rectified with a shallow lukewarm bath.